This document describes the step to configure an Infoblox NIOS device using the ThreatSTOP Centralized Manager. You will first need to have a working TSCM virtual machine. The steps to install the VM are described in the TSCM Overview. Command line switches for the tsadmin tool are documented here . Device name: This is the nickname of the device provided to the ThreatSTOP portal. Log upload IP address: The external IP address of your network. If you are uncertain of what address to use please visit https://www.threatstop.com/cgi-bin/validip.pl this will show the address to provide. All possible syslog source IP(s): This utility sets up one logging device, but can receive logs from multiple NIOS devices. Enter the IP addresses of the NIOS devices from which the logger will receive logs. Log rotate size, in Kb: Logs can be cached by NIOS devices until they reach a certain size and then batch uploaded to the logging device. Send logs to ThreatSTOP? : If the logging device should send the received logs to ThreatSTOP set this to Y.
Login to your TSCM device. This will add a NIOS logging device, and provide the following setup questions. Press ENTER to accept the default (Y) for the Configuring ‘ThreatSTOP Log Relay Device’ prompt. Enter the external IP address that will be providing Log data to ThreatSTOP at the Log upload IP address prompt. Enter the device IP adresses for any NIOS devices at the Please enter all possible syslog source IP(s): prompt. Enter the Log rotation size, in Kb to enable rotation. Most users keep this set this to around 100 Kb. For Send logs to ThreatSTOP? press ENTER to accept the default. This will complete your setup and begin sending your logs to ThreatSTOP. Click on the Add icon at the top right of the table. 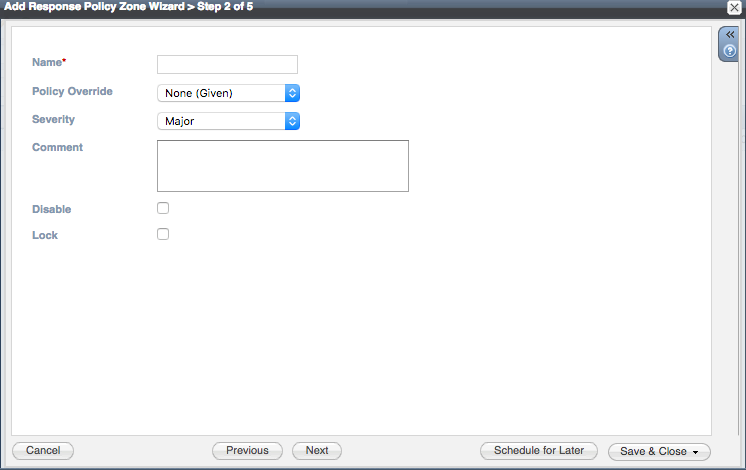 This will open a wizard dialog to add the RPZ feed. 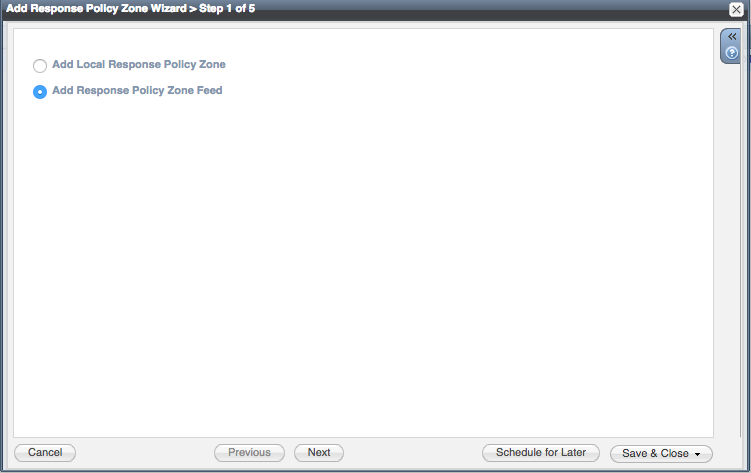 Enter in the name of the RPZ zone and click Next button. Select the down arrow next to the Add icon button and select Grid Secondary. Click on the Select button below Add Grid Secondary then click Add button. 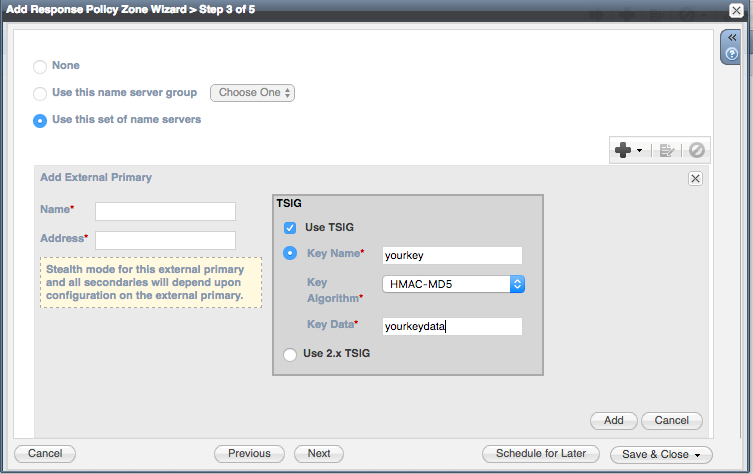 Setup TSIG by selecting Use TSIG checkbox. Retrieve the key name and secrete from your device settings on the ThreatSTOP Portal. Select hmac-md5 for the algorithm. Click Add button to insert external DNS server into table. Click Next button to go to next wizard screen. Click Next button without making any changes to Extensible Attributes. Click Next button to accept Schedule Change - Now option. Click Save & Close button to submit changes. These steps will help you to configure your NIOS device to report RPZ events to ThreatSTOP, and relay them through the TSCM vm. Enabling Logging for RPZ ** Assuming you have setup the DNS service and are using RPZ domains, you need to verify that the RPZ events are being captured as logged events. Navigate to Data Management –> DNS –> Members -> Grid DNS Properties –> Edit. 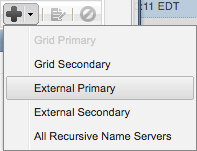 Once the Grid DNS Properties window is open, select the Logging tab. Change the Logging Facility to LOCAL7 unless another facility is required for logging. Select the categories desired, but at a minimum, ensure that rpz and security checkboxes are selected. Click the Save & Close button when finished to apply the changes. A restart of the DNS service will probably be required. Open the Grid Properties, Select Grid –> Grid Manager –> Members –> Grid Properties –> Edit. Once the Grid Properties Editor window is open select the Monitoring tab. Select the Log to External Syslog Servers checkbox if not already selected. 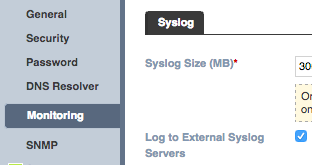 Click on the Add Server icon at the top right of the External Syslog Servers table. This will display a form to the a syslog server. Change the Transport to your preferred method. Select the Interface that NIOS server will us to send syslog packets. Change the Node ID to Host Name. 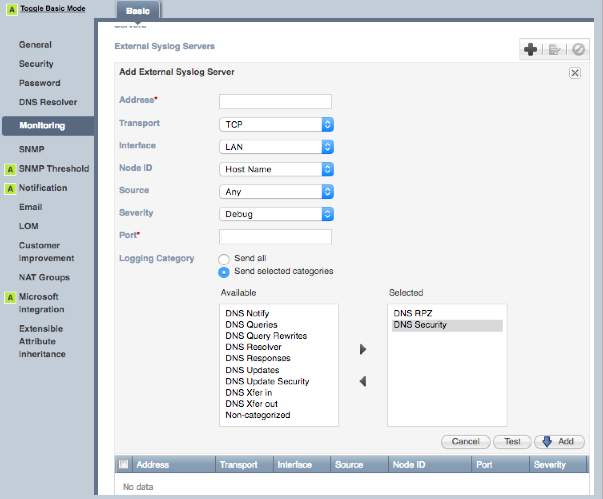 Change Logging Category to Send selected categories and select DNS RPZ and DNS Security categories only. 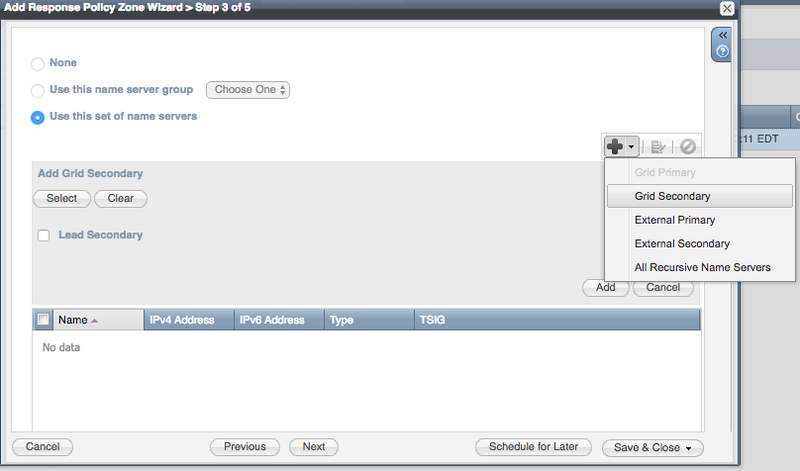 Click the Add button to insert the new syslog server into the table. Click the Save & Close button to complete the setup of the external syslog server. A service restart may be required. From a device behind the firewall that is not the TSCM, attempt to connect to bad.threatstop.com with a web browser. If the connection is blocked, you will see a connection blocked error message in the web browser, and the log being tailed will update. If the connection is not blocked you will see the ThreatSTOP logo appear, and the configuration settings will need to be double checked. If the command runs successfully update the device’s configuration as detailed in TSCM Configuration to begin sending logs back to ThreatSTOP for enhanced security.